So many times I've had women tell me "I like your necklace. I wish I could wear something like that, but I would look weird." I can relate to that feeling because up until 2006, I was the same way. 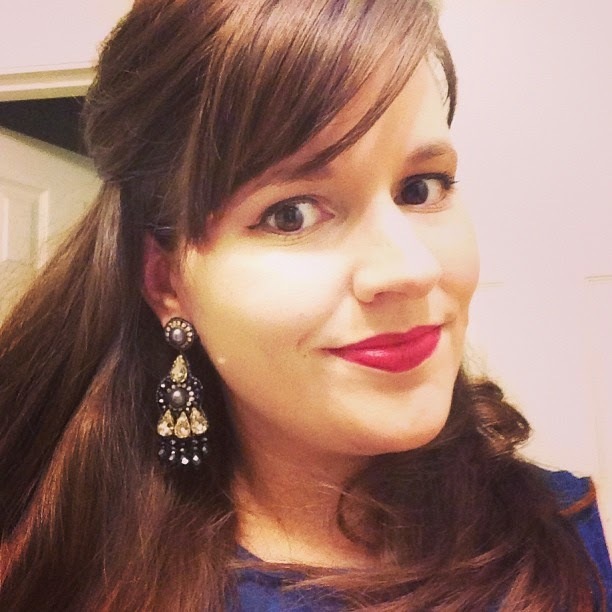 I wore a small diamond solitaire on a white gold chain almost every day. I still wear it sometimes, but after college I was pretty poor (not gonna lie) and had to find ways to make my nine outfits look like more than nine outfits. Since it took some trial and error for me to figure out what works, I thought I'd show how to style a few beginner necklaces in hopes of growing the ranks of Brave Necklace Wearers. Besides a solitaire, there isn't another necklace that's easier to wear. I have two, one thick and one that's more delicate, and wear them with every style of outfit I own. I'll throw them on with a tank top and bermuda shorts, or with my work outfits. If you're only getting one, I'd go with something a little on the thicker side so people will see it. As you get comfortable, add a gold or bronze necklace to your collection too. 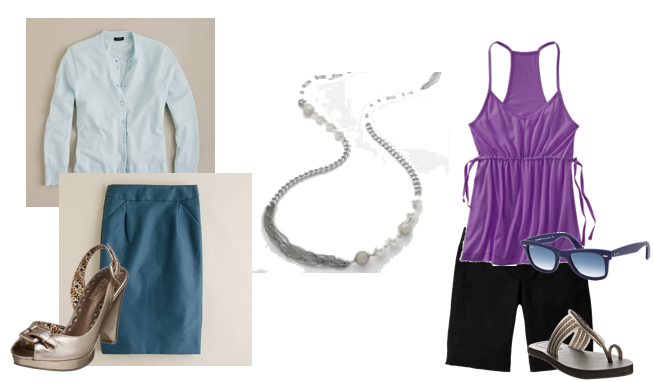 These necklaces take a touch more courage, but make a plain top into an outfit that looks like you planned it. I have this type of necklace in turquoise and red and wear both quite often, especially in the winter with my 3/4 sleeve v-necks, but also with tank tops and dresses in the summer. 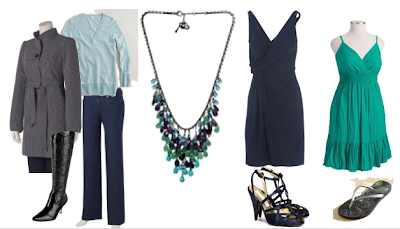 To prove the versatility, I styled a winter work outfit, a more formal evening look, and super casual summer dress all with the same Fossil necklace. Too many people are afraid of necklaces as big as their hands, but I think they look so great on most people as long as the necklace sits at the neckline of your top (or you're going strapless). If the necklace is bold and bright, like the one below, it still goes with a lot of things but you may have to adjust the length so that it sits in the right spot. I'm not above extending my necklaces with a chain of safety pins to make it line up with my top. 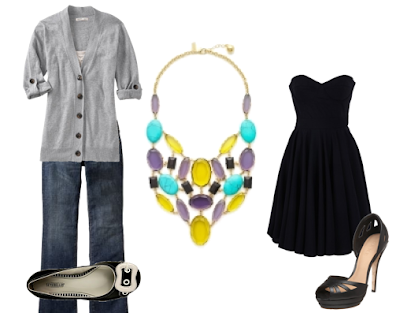 I think colorful stones go as well with jeans and a neutral cardigan as with a more formal look for an evening wedding. Hopefully this inspired a few of you to be brave and branch out. If you see a necklace you like, but don't know how to wear it, let me know and I'll help out. agreed as i rock my 3 strand turquoise layer necklace!!! something happened a few years ago that made me think this wasn't gaudy anymore!